Last Saturday, South Campus brought many sources of noise, from the chatter of people waiting in line for free lunch from a food truck, to the shouts of people jumping on inflatable rides to the hiss of students riding a zipline. 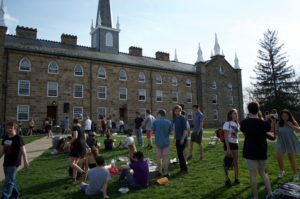 Most of all, the sound of music blasted out of speakers in front of Old Kenyon. This blending of different noises was the result of an unexpected coincidence. On Saturday, April 15, Kenyon’s student radio station, WKCO, hosted an 11-hour “WKCO Fest” on the South Quad in celebration of the station’s 70th anniversary. 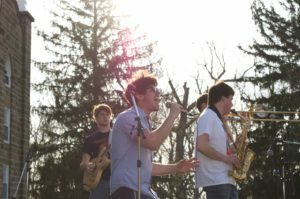 WKCO’s outdoor concert featured over a dozen Kenyon and alumni musical acts, including Motown, the Handsome Devils, Vince and Nick’s Dad. By chance Social Board had scheduled an event on Ransom lawn for the same time. 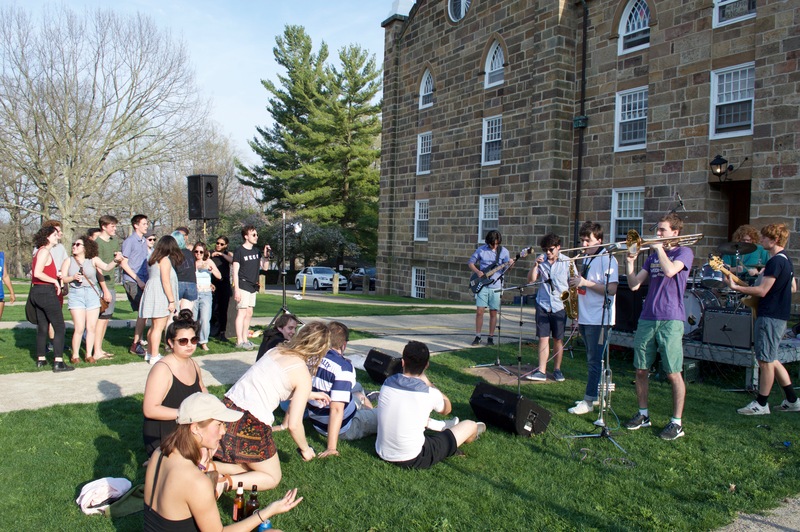 WKCO Fest was intended not only as a celebration of the radio station’s anniversary but also as a way to commemorate the Farr Hall location before the building’s demolition and welcome back to campus alumni of WKCO. 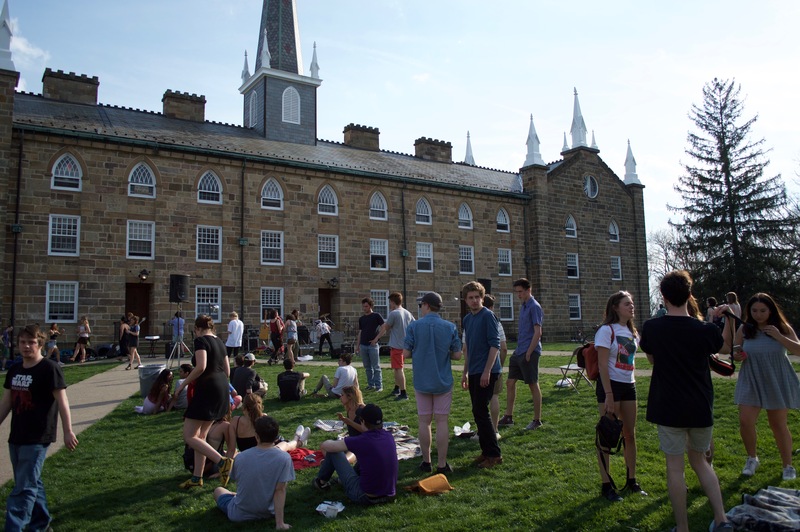 The event also housed a table selling vinyl records from the WKCO collection, WKCO shirts and original artwork from Kenyon students. WKCO Fest was planned months in advance, starting in the fall. The organization received the funding for the event through a GoFundMe campaign. 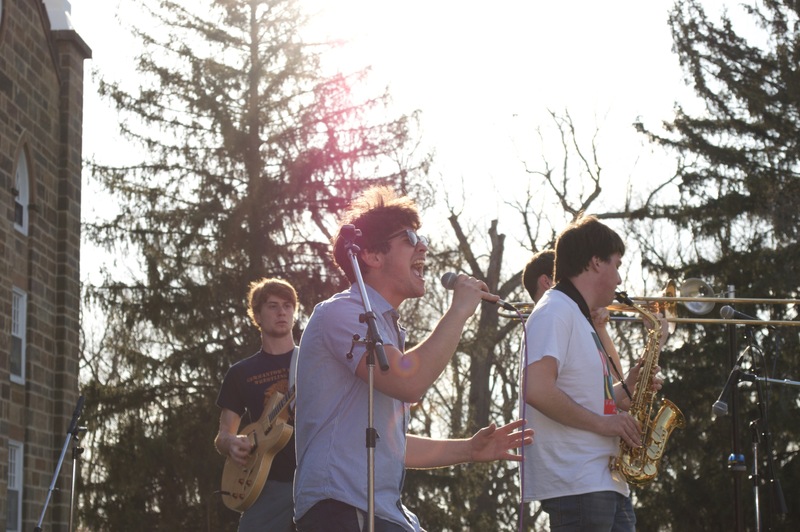 Originally, WKCO hoped Kenyon alumni bands SPORTS and Pinegrove would perform. Pinegrove, however, was out of their price range, and SPORTS was ultimately unable to attend. Instead, the headlining bands were Hiccup and Total Failure, also alumni bands. Because so many bands were in attendance, one band ended up having to camp out in the WKCO radio station. Overall, the concert achieved its goal of bringing positive attention to Kenyon’s 70-year-old radio station, according to Fuisz. “We wanted it to be like something for people to notice us,” Fuisz said. A compilation CD of many of the Kenyon musicians who played at the festival will be made available next week.